The first of two volumes by Jack Bruce covering Nieuports 11, 16, 17, 21 and 23. 52 pages (10 in colour) with over 15 colour close-ups and over 20 sparkling profiles of International Nieuports.There are six pages of drawings with a total of 85 archive photos plus nine close-ups. One of our best selling titles and perfect for modellers contemplating the 2018 1:32 scale release by Copper State Models! LATEST edition features the Roden SE5a,more Master Class,colour controversies, scale plans and new colour profiles! Jon Guttman relates the amazing story of America's volunteer airmen in WWI; the famed Lafayette Escadrille's Nieuport flyers. 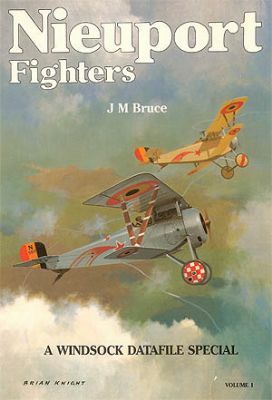 Jack M Bruce presents the second of two volumes covering the Nieuport fighters.